We discovered this builder took some shortcuts by using 1/2" plywood for the stair risers that did not have a supporting system in the center of the step. All step risers had to be corrected to provide better stability after the hardwood is installed. Without doing so chances are good we would have a squeak or two. The image shows the first step riser replaced, but not the remainder due to time constraints of the author. Always keep that broom or vacuum nearby for cleanup! If you're using a tarp or similar on a completed section of hardwood, always keep tools, scrap pieces, nails, and screws out of the work area to prevent damage. It only takes one incident and you may have a nice gouge in the floor. To install the riser material, chances are very good the drywall or stair stringer will not be straight. My suggestion is to use scrap pieces to scribe the angle. Shown on the right, our first course was a perfect 90º on both sides of the riser. The second piece however, was not perfect and required scribing to get the angle right. By the way, we're using an engineered 3/8" x 3" plank manufactured by Mannington. With the riser measuring 6 3/4" from the bottom we'll be installing two full courses (rows) and a small cut-off for the remaining. 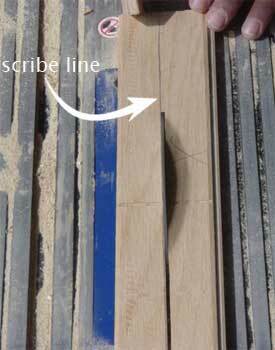 There are two methods of layout when installing plank or strip on steps. It will depend on the product selected and what you view as more appealing. If you desire full length boards on every step and riser it's suggested to find a product that offers this. Many engineered manufacturers produce random lengths where you'll be getting pieces from 12" to 48 inches. Others offer one common length such as 36" or 48" in every box. When trying to achieve the tightest fit against the stringers or drywall, so as to eliminate caulking or unsightly trim, one trick is to bevel the backside of the piece. 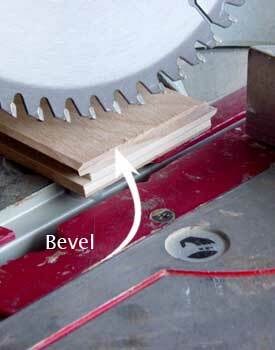 This technique is best achieved with a compound miter saw set at a 30 - 45º angle. You could also set up a belt sander to remove, or carefully cut the bevel with a table saw. Beveling allows easier engaging of tight fitted boards against the stringers or drywall reducing scraping of paint when they are installed. Folks, if you want the job done right you may be making three to four trips back to the sawing area to get one piece cut right. Staircases are a major focal point in the home and people will notice the flaws. Once we have the desired fit for the first two rows it's time for nailing. 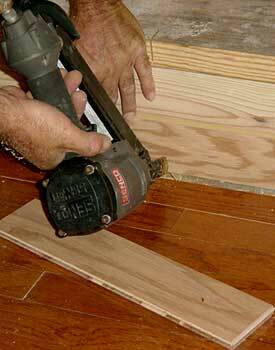 Renting or buying a pneumatic nailer will speed the job considerably. In this case we're using a Senco finish nailer that shoots 18 gauge 2" nails. Some of the thinner 3/8" products may have a hard time taking a 15 gauge nail. Our suggestion in this case would be 18 gauge wire nails but double up on the number used for better holding. It's also not a bad idea to dab some adhesive on the back of the boards being installed. For the first course we want to face nail into the riser substrate, three nails across the width near the bottom of the board. To further secure, blind nail into the top of the board (tongue facing up) at a 45º angle. How many nails? It doesn't really matter as they will not be visible once the next row is in place. 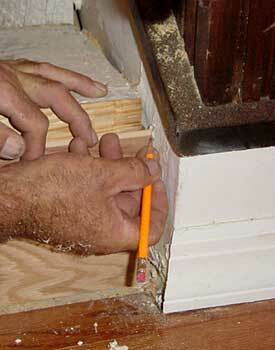 Make sure our blind nailing doesn't interfere with engaging the next board by way of tongue and groove. If in doubt set all nails with a nail punch. Now we have the first two courses installed against the first riser. For the final small piece that will fit just under the stair nosing, measure the distance from one side to the other and cut the piece to be used on the chop saw. Fit it into the area and scribe from the backside. 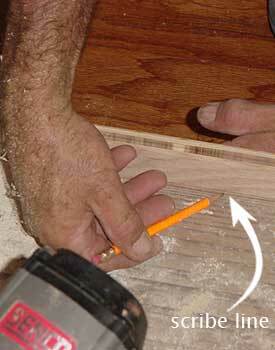 Keeping your pencil flat to the substrate, run a line across the backside of the hardwood. It may take a few tries to get the hang of it but it's important this cut be right on the money. Otherwise the stair nosing itself will not sit proper and could eventually sag or squeak. I've found the table saw to be a more effective power tool for this cut, however a good quality saber or jig saw will work just as well. Table saws are not to be taken lightly as these cuts have to be done freehand. It's important the working area be clean and free of obstructions. This is not the place for kids to be running in and out either. Be sharp; if you're tired, do it another day. Always wear eye protection. In our illustration Tony makes our rip cut on the outside of the line, or actually shaving off part of the pencil mark. The area marked X (barely visible) is the part that will not be used. Once you have the desired cut, take it back to the working area for a dry fit into place. If it's not flat or flush with the tread substrate, corrections will have to be made. 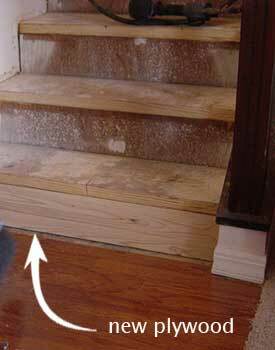 By keeping a scrap piece of stair nosing around, you should get an idea whether or not it is sitting stable. Remember, any rocking or a loose fit is likely to cause problems at a later date. Engage your final piece or pieces and nail at a 45º into the substrate riser, preferably in the middle of the material. Again these nails won't be seen, so the more the merrier, but don't overdo it. It's important to keep to the angle penetration, otherwise the nail may not engage. Set all nails that may not be flush. 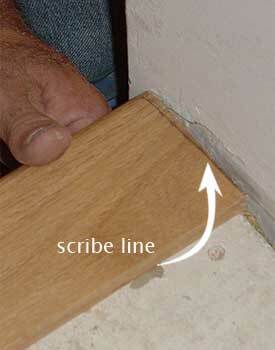 Using a piece of scrap nosing, we have to determine the cut on both sides of the step itself. Like the riser, angles are likely to be different. In this case Tony has the left hand side marked and ready for cutting. It's off to the chop saw again to get our angles right. When making these cuts, mark the angle you've found so you don't have to start over again. Once you feel they're right, it's back to the steps for another dry fit. Most of the time adjustments will have to be made. Don't feel alone if you've made two or three trips to the cutting area. Some of the best do the same. Now comes the tricky part. One side angles out at 1 1/2º and the other in by 3/4º. Set your tape measure where the front of the nosing will eventually rest and measure to each side. It's wise to make a pencil mark on the stringer or drywall for this location. Measure not once, but twice the distance from each side. Add an eighth of an inch until you get the hang of it. The worst thing you can do is cut it short. By cutting long you can always go back to the chop saw and cut more.